Triangle became the most successful club in Parish Cup history with a convincing six-wicket success over Mytholmroyd at Sowerby Bridge today. A third-wicket stand of 117 between Gary Rodger and Christian Silkstone paved the way for them to move smoothly past ‘Royd’s below-par 177 all out. The Grassy Bottom club were lifting the trophy for the 12th time in the competition’s 128-year history, one more than now-defunct Halifax CC. A cold, damp and grey morning gave way to bright sunshine and the improving weather attracted a bumper crowd of 1,050 to Walton Street, where Bridge are always superb final hosts. A close game had been predicted between two free-scoring Premier Division sides. However, it was Triangle’s day from the moment Silkstone won the toss in the Briggs Priestley Engravers-sponsored contest. 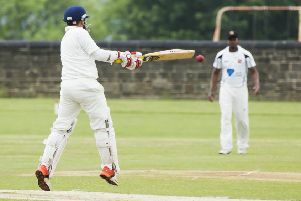 Saturday’s rain meant there was sure to be some early assistance for the bowlers and ‘Royd, who have themselves won the Halifax League’s main knockout competition nine times, were always struggling to post a decent total. Luke Sutcliffe’s 29 was the top contribution and their best stand was one of 31 for the ninth wicket. Triangle produced a disciplined bowling performance, spearheaded by Kurtis Whippey and young left-armer Tom Fryer. They took a wicket each in successive overs, Steve Senior dollying a catch to Ryan O’Neill at square leg and the impatient Zeb Mahmood being bowled to leave ‘Royd 21 for two after eight. Opener Spencer Harris (26) and Luke Sutcliffe (29) tried to repair the damage but experienced medium pacer Dave Turner undermined ‘Royd’s efforts in a performance which earned him the man of the match award from Southowram’s Pete Jowett. Turner trapped Harris leg before and then bowled Adie Gawthrope - who had survived loud caught behind appeals earlier - and Chris Overend. When Sutcliffe’s mis-hit was scooped up by the bucket-sized hands of Carl Fletcher off Martin Uttley’s bowling, Royd had lurched to 96 for six in the 30th over. Jacob Travis (27) led a determined rearguard action from ‘Royd which ended when the young wicketkeeper holed out to Whippey off Fletcher’s bowling in the penultimate over. The total looked 50 short but Amjid Azam gave ‘Royd a glimmer of hope by dismissing openers Neil Uttley and then Nathan Madden to leave Triangle 48 for two in the 16th over. However, the stand between Rodger and Silkstone, whose batting styles are like chalk and cheese, quickly tipped the scales firmly Triangle’s way. The experienced Rodger, who started the season playing in Triangle’s thirds due to his postman duties on a Saturday, is rock solid in defence and works the ball around the field. He claims to “only hit the ball on the carpet” and proved the point with 12 fours in his 61. Silkstone, who spend last winter cricketing in Australia, is a sweet timer who is not afraid to go aerial. While it might have proved his undoing on a couple of occasions he cleared the boundary edge six times. His 74 earned him the trophy presented in the memory of another Triangle player, Brian Hunter, for the game’s highest score. Once the pair had seen off the threat of returning paceman Jack Earle, victory looked a formality but both Silkstone and then Rodger fell with victory in sight. It was left to Fletcher, who hit the biggest of sixes with the scores level, to spark the Triangle celebrations. Bowling: K Whippey 9 1 24 1, T Fryer 9 1 27 1, C Fletcher 9 0 47 1, D Turner 9 3 28 3, M Uttley 8 1 36 3. Bowling: J Earle 9 3 56 1, A Azam 9 3 51 2, Z Mahmood 3 0 21 0, A Gawthrope 9 0 25 0, J Cowens 5 0 28 1, D Murgatroyd 6.1 1 33 1. Didn’t bat: D Turner, M Uttley, R O’Neill, T Fryer, K Whippey.